Most full-service moving companies will assist you with everything you require, in order to transfer you to your new location – including pets! Often people think this is an added service but the truth is that most moving experts will gladly assist you with your best friend. From start to finish, they will ensure that your move will be a breeze including transporting Max the golden retriever, Chloe the Siamese cat and Bubbles the goldfish. It can be exciting for us – seeing new sites, getting to know new people and a new location. Alas, it may not be the same for our furry friends. Here are some tips for homeowners before, during and after moving day. Take them out of this chaotic flurry of feet. Keep them away from the noise by putting them somewhere quiet and comfy during the packing and unpacking days. Pack up one of your smaller rooms ahead of time and give them their own private getaway. Taking time to familiarize your pet with their carriers ahead of time can be helpful. This way you wont have to worry about struggling to get a unwilling pup into his carrier. Max can enjoy his favorite squeaky toy, Chloe and cuddle up into her favorite blanket and you can focus on the move. Remember to get all your pets’ records or have them transferred to your new location’s vet. Or if you don’t have a new vet yet, ask from your new neighbors to get some friendly chatter. Bring extra prescriptions or any medication to make the travel more comfortable. Once you are settled into your new location its time to relax. Let Max have some exercises around the block. For Chloe, she can now roam around the new house freely. Set up the litter box and food in places nearby. Bubbles can be placed anywhere you deem fit. Always remember, like humans, they too need a few adjusting. Give each other time. Pets can pick up their owner’s disposition so try to relax. 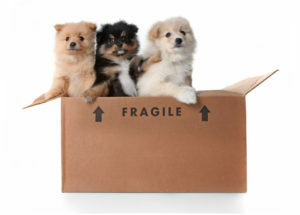 Still nervous about moving with your pets?  Contact a certified mover – Rainbow Movers – for a free quote and let us take some of the stress out of your move. Give us a call at (508) 528-4111.